All Sizes given are the bells' diameter weight chart at bottom of page. A true church bell is found in a steeple and is used to call the faithful to service on Sunday mornings to announce weddings and to toll at funerals. 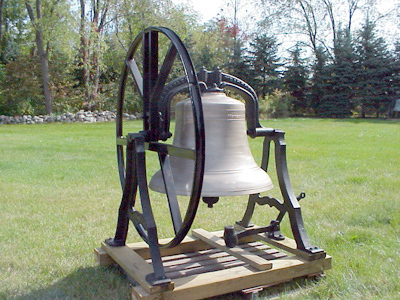 The size of a typical church bell is 28" and greater and the weight is 400 lbs. and up. Most of them are cast bronzeand have a deep rich tone. You just cannot get a church bell sound out of a small bell smaller bell sounds are associated with a small chapel or school. Our complete swinging church bells come with yoke clapper wheel A frame stands and a toller (if desired) We can also sell you JUST the bell and it can be electrified to ring remotely. (we have to send them out for the electric) BUT most of our customers prefer the old fashioned rope pull method of ringing the bell. We do not offer electronic bell sounds. Or as some call them singing bells etc. WE only deal in REAL bells real bells have been rung for thousands of years and will never go out of style or have parts that have been discontinued. I have heard lots of complaints from churches that were not satisfied with their recorded bell sound systems. It seems when something breaks down they can no longer get parts Like computers they are out of date or change models real fast. A real bell when rung properly will last for ever and always be in style. We do not have any spare church bell parts to sell sorry. If you have a church bell for sale or want to trade one in - WE BUY BELLS. Check out our We Buy Bells page for details. For more Large Bells go to Unfinished Bells page. 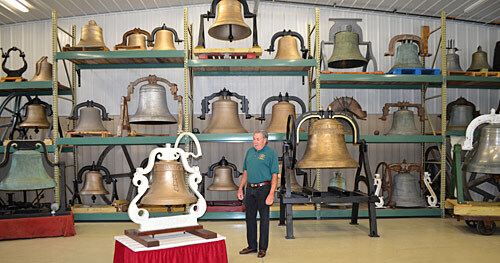 Below are some of our current stock of church bells for sale. The following bells are refurbished and ready to go into any setting. Bells with yokes can be fitted with pillow block bearings or A-frame stands. The bells below are bare; they have been cleaned up or refinished but do not come with supports, bearings, etc.. All bells come with a clapper. Below is a chart you can use to calculate the size of a given bell and the size of the supporting frame for it. The data was copied from a Meneely Bell catalog. Entire Site © 2010 - 2018 Brosamer's Bells Inc.